Thanks to your feedback, Swimia has turn into in just various months one one of the most very important sites of swimming pools. Here you have got all the info we know about SoHo Metropolitan Hotel & Residences, in Toronto. 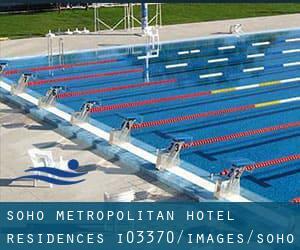 Don't forget you can also promote this pool so SoHo Metropolitan Hotel & Residences will appear the first of Toronto, or even the very first of your country, contact us to know extra. Swimmers like you reported 18 meters, Indoors. Unfortunately we do not have the email address of this Swimming Pool, but we can give you the phone number. Updated on 2019 1451 Avenue Rd. , Toronto , Toronto - Toronto / East York , ON , CANADA (Postal Code: M5N 2HN). Among all the activities supplied by the centre, if you are keen on swimming you will take pleasure in 25 meters, 6 lanes, Indoors. Updated on 2019 100 Front St. West , Toronto , Toronto - Toronto / East York , ON , CANADA (Postal Code: M5J 1E3). This sports centre offers 50 feet, 3.5f - 4 feet depth, Indoors. Contact information for this Swimming Pool such as phone number and e-mail address are number. 1555 Midland Avenue , Toronto - Scarborough , ON , CANADA (Postal Code: M1P 3C1). Swimmers like you reported 25 meters, Indoors. Unfortunately we do not have the email address of this Pool, but we can give you the phone number. Updated on 2019 29 St. Dennis Dr. , Toronto - North York , ON , CANADA (Postal Code: M3C 3J3). Among all the activities supplied by the centre, should you be keen on swimming you will appreciate 25 meters, 4 lanes, Indoors. Just in case you want to make contact with this Swimming Pool before dropping by, we only know the phone number. 56 Woodfield Rd. , Toronto , Toronto - Toronto / East York , ON , CANADA (Postal Code: M4K 1L4). Swimmers like you reported 22 meters, Indoors. Unfortunately we do not have the email address of this Swimming Pool, but we can give you the phone number. Updated on 2019 123 Queen St. West , Toronto , Toronto - Toronto / East York , ON , CANADA (Postal Code: M5H 2M9). Swimmers like you reported 25 yards, 4 striped lanes, Salt Water, Non-Chlorine Sanitized, Indoors, Outdoors. Unfortunately we do not have the e-mail address of this Swimming Pool, but we can give you the phone number. Updated on 2019 7 Hart House Circle , Toronto , Toronto - Toronto / East York , ON , CANADA (Postal Code: M5S 1A2). This sports centre delivers 25 yards, 4 lanes, 6 feet - 7 feet depth, Indoors. Contact details for this Pool such as phone number and email address are number. Updated on 2019 93 Birchmount Road , Toronto - Scarborough , ON , CANADA (Postal Code: M1N 3J7). This sports centre provides 25 meters, 6 lanes, Indoors. For this Swimming Pool, only phone number is number here. 2350 Bayview Avenue , Toronto - North York , ON , CANADA (Postal Code: M2L 1E4). Among all the activities offered by the centre, if you are considering swimming you can enjoy 25 yards, Indoors. Just in case you want to make contact with this Swimming Pool before dropping by, we only know the phone number. Updated on 2019 843 Palmerston Avenue , Toronto , Toronto - Toronto / East York , ON , CANADA (Postal Code: M6H 4C3). This sports centre offers 20 yards, 4 lanes, Indoors. For this Swimming Pool, only phone number is number here. 23 Grange Road , Toronto , Toronto - Toronto / East York , ON , CANADA (Postal Code: M5T 1C3). Swimmers like you reported 25 meters x 12 meters, 4 lanes, Indoors. Unfortunately we do not have the email address of this Swimming Pool, but we can give you the phone number. Updated on 2019 145 Richmond St. W. , Toronto , Toronto - Toronto / East York , ON , CANADA (Postal Code: M5H 2L2). Swimmers like you reported 25 yards x 20 feet, Indoor/Outdoor. Unfortunately we do not have the email address of this Swimming Pool, but we can provide you with the phone number.